Jet contrails (a contracion of 'condensation trails') are man-made clouds that form through condensation of water vapor in the exhaust of jet engines into ice crystals. Water vapor is a natural by-product of the burning of petroleum-based fuels, and the amounts produced by jet engines are sometimes larger than the cold, thin air of the upper troposphere can hold in vapor form. As a result, some of the vapor condenses as water droplets, which then rapidly freeze into ice particles very similar to high-altitude cirrus clouds. 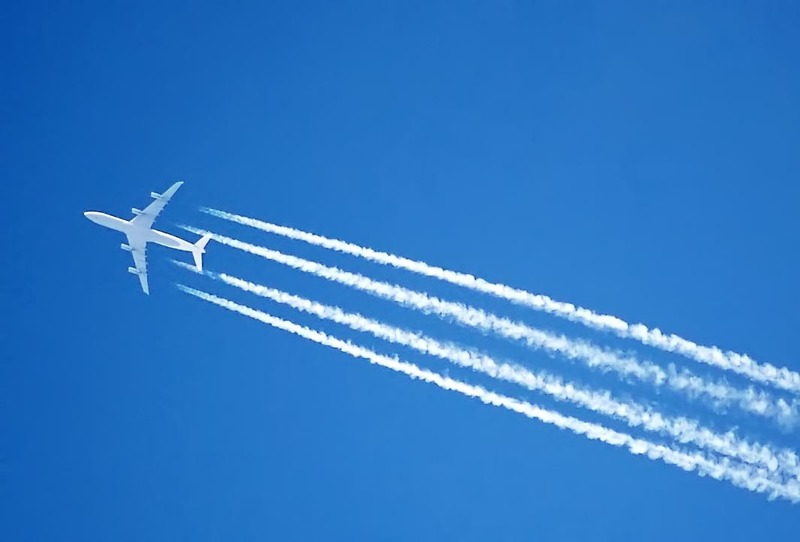 If the air has low relative humidity, then a contrail will not form because the extra water vapor produced by the jet engines is not large enough to produce condensation. But if the is air has high relative humidity, then a contrail forms, using up the excess water vapor that the air can not hold. Studies have shown that the amount of ice in jet contrails is larger than can be accounted for by just the water vapor in the exhaust of jet engines. Apparently, the ice particles continue to grow after the use us the water vapor produced by the jet, and then feed off the water vapor contained in the air in and around the contrail cloud.